Both the New England Patriots and Dallas Cowboys sported unblemished 5-0 records as they faced off at Texas Stadium on October 14, 2007. The Patriots had yet to score fewer than 34 points in any of their games, or give up more than 17, while Dallas had been only a bit less dominant. Under Head Coach Bill Belichick, the Patriots had been molded into perennial contenders, reaching the playoffs in five of the previous six seasons that included three NFL Championships. They were guided on offense by QB Tom Brady (pictured above), who was at the height of his abilities at age 30. There were no stars among the running backs, but WR Randy Moss had been added to the receiving mix with outstanding results thus far, WR Wes Welker was a reliable possession receiver, and there was good depth behind them. The defensive line was excellent and the linebackers an experienced and savvy group. Dallas, coached by Wade Phillips, also had a talented quarterback in Tony Romo, who had come out of nowhere the previous year to take over the starting job, and excellent receivers in WR Terrell Owens and TE Jason Witten. The running duties were shared by Julius Jones and Marion Barber, with good results. On defense, the corps of linebackers, led by DeMarcus Ware, was effective, but the backs were vulnerable to being spread out – as the Patriots would show. The Cowboys had first possession and punted. New England went 74 yards in 14 plays in response. After misfiring on his first two passes, Tom Brady connected with Wes Welker for 16 yards on third-and-ten and was successful on his next four throws, three of them to WR Donte’ Stallworth that totaled 25 yards. Facing third-and-seven at the Dallas 26, Brady again completed a pass to Welker for 20 yards and, three plays later, hit Randy Moss for a six-yard touchdown. Stephen Gostkowski added the extra point. The teams traded punts until the Patriots again put together another scoring drive, this time advancing 69 yards in six plays. Once again Brady made big plays on third down, throwing deep to TE Ben Watson for 28 yards in a third-and-seven situation to reach the Dallas 38 and then, on third-and-seven, to Welker for a 35-yard TD. Gostkowski again successfully converted and New England took a 14-0 lead into the second quarter. The Cowboys moved into New England territory on their next series and Nick Folk got them on the board with a 38-yard field goal. They scored again a short time later when Brady fumbled while being sacked by LB Greg Ellis and DE Jason Hatcher recovered and it returned it 29 yards for a touchdown. Folk’s PAT narrowed the visitors’ lead to 14-10. The Patriots responded with another long series. Falling quickly into a second-and-20 hole, Brady passed to Stallworth for 17 yards and an offside call on the Cowboys gave New England a first down. Another completion to Stallworth gained 15 yards and, in a third-and-ten situation at the Dallas 42, Brady’s short toss to RB Kevin Faulk picked up 18 yards. The series ended with Brady once again throwing to Welker for a touchdown, this time from 12 yards out. Gostkowski’s extra point extended New England’s lead to 21-10. Dallas regained possession with 3:28 remaining in the first half. Tony Romo immediately connected with TE Anthony Fasano for 26 yards, the first of seven completions that included three to Jason Witten for 11, 25, and 11 yards. A pass to Terrell Owens that was ruled complete but overturned on review was followed by a 12-yard TD pass to Owens and, with Folk’s extra point, the score stood at 21-17 at halftime. New England’s first possession of the third quarter ended with a punt and the Cowboys put together a seven-play, 74-yard drive. 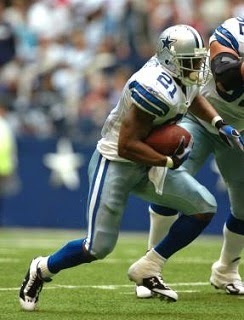 Julius Jones (pictured above) had back-to-back runs of 25 and 18 yards along the way and Romo was successful on all four of his passes, the last to WR Patrick Crayton for an eight-yard touchdown. Folk added the point after and Dallas was in the lead by 24-21. The Patriots responded with a scoring drive of their own, covering 77 yards in ten plays. Brady completed six passes, a pair each to Moss and Welker, and when Moss was interfered with by safety Pat Watkins, New England was at the one yard line. Brady tossed to TE Kyle Brady from there for a TD, Gostkowski added the PAT, and the visitors were back in front by 28-24. The Cowboys were unable to move beyond their 12 yard line on the next possession and Mat McBriar’s punt, which was returned 18 yards by Welker, gave the Patriots good field position at the Dallas 43. An apparent touchdown pass was overturned by review, but a roughing-the-passer penalty advanced New England 15 yards and, while the drive stalled at that point, Gostkowski added a 45 yard field goal to make it a seven-point game. As the period came to a close, Dallas had fourth-and-one at its own 47, but an attempt to convert was nullified by a holding penalty and the Cowboys had to punt. Four plays later, Brady went long for Stallworth and the result was a 69-yard touchdown. Gostkowski’s extra point put New England ahead by 38-24. RB Tyson Thompson returned the ensuing kickoff 72 yards to the New England 23, but after Romo threw to Owens for 13 yards, the Cowboys were unable to reach the end zone and had to settle for a 23-yard Folk field goal. Ahead by 11 points, the Patriots put together a long drive that burned six minutes off the clock. Brady completed four passes, Faulk ran the ball six times, and Gostkowski kicked a 22-yard field goal to extend New England’s lead to 41-27 with just over four minutes remaining on the clock. On the first play of the next Dallas series, LB Junior Seau intercepted Romo’s pass to effectively extinguish any hopes for the Cowboys. The Patriots added one last touchdown on a one-yard carry by FB Kyle Eckel and came away with a decisive 48-27 win. New England was statistically dominant, leading in total yards (448 to 285) and first downs (28 to 13). Each team turned the ball over once. The Cowboys recorded three sacks, to two by the Patriots. They also were penalized 12 times, at a cost of 100 yards, compared to five flags thrown on New England. Tom Brady completed 31 of 46 passes for 388 yards and five touchdowns while giving up no interceptions. Wes Welker (pictured below) had 11 catches for 124 yards and two TDs and Donte’ Stallworth gained 136 yards on 7 receptions that included a score. They benefited from Dallas’ coverage of Randy Moss, who still caught 6 passes for 59 yards and a touchdown. Kevin Faulk was New England’s leading rusher with 47 yards on 12 attempts. For the Cowboys, Tony Romo was successful on 18 of 29 throws for 199 yards and two TDs with one interception. Terrell Owens topped the receivers with 6 catches for 66 yards and a touchdown and Julius Jones ran for 51 yards on six carries, followed closely by RB Marion Barber who had 49 yards on 9 runs. Mat McBriar averaged 53.8 yards on his five punts. “The reality is we got a win on the road and we’re 6-0. That’s what is important,” summed up Tom Brady. “Any time you win you’re doing just fine. It’s another step in the process. We have to continue to make improvements. The Patriots improved all the way to a 16-0 record in the regular season, but came short of ultimate perfection with an upset loss to the New York Giants in the Super Bowl. Dallas recovered to win its next seven straight games on the way to a NFC-best 13-3 tally. However, they lost in the Divisional playoff round to the Super Bowl-bound Giants. Tom Brady led the NFL in passing yards (4806), completion percentage (68.9), yards per attempt (8.3), and overall rating (117.2) as well as a then-record 50 touchdown passes and received consensus MVP honors as well as All-NFL and Pro Bowl recognition. Randy Moss caught a record 23 TD passes among his 98 receptions for 1493 yards and Wes Welker tied for the league lead with 112 catches, good for 1175 yards and eight scores. Tony Romo passed for 4211 yards and a NFC-high 36 touchdowns, although his 19 interceptions ranked among the league leaders as well.